Tribbles, no tribble nor trouble at all? Think again, oh tribble loving tribe. These terminally cute puff balls purr and bleep at us from all corners of the known galaxy. But looks are often incredibly deceiving. Can their adorable veneer be simply a clever act to throw us off? 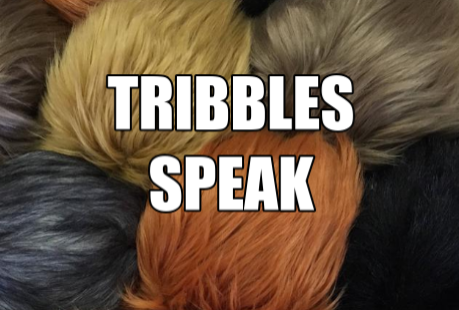 Starfleet engineers finally enhanced the legendary Universal Translator to decode the surprisingly sophisticated Tribble language. Get ready, folks, We invite you to nibble on a Tribble chat you won’t soon forget. Laugh Trek sought out experts in translation. Starfleet took the ancient Google Translate program and tweaked it till they had a Universal Translator. Legendary in its ability to convey meaning of literally every known alien speak – or unknown language – around, the Tribbles used the last language which eluded the program. Starfleet scientists were kind enough to set up the new high tech magic with a few Tribbles. Here’s our fascinating chat with the infamous Klingon hating pets. Thanks for talking to us. We’re glad we can understand you. How funny. We always understand you. Clear indication of our superior mental abilities. Your race first came to prominent noteriety when Enterprise Captain Kirk got a bunch of you from the trader Cyrano Jones. Do you have any knowledge of that incident? Of course. Our kind employs cellular memory to pass down all information. A bunch of us – how casually you treat our numbers. We are all well aware of James T. Kirk and his infamous introduction to our people. Infamous? You make it sound like it was a really bad moment for both humans and Tribbles. Make of it what you will, infinitely curious human being. Our race was immediately looked down upon and treated as pets. How would you like to be kept in a box and fondled repeatedly throughout your day? Honestly? That sounds kinda sweet. Not surprising. Your kind has always been shockingly strange to more sophisticated lifeforms such as ourselves. Look, we aren’t trying to be confrontational, insulting nor humor you guys in anyway. This is a true breakthrough for both our species. We want to know you better, to learn all we can. Learn this human being. Know that our kind is tired of being trotted around like prize powder puffs. We have things to do, namely worlds to conqueor. Why do you think we’re born pregnant? It’s the ultimate time saver! The United Federation of Planets may not be large enough to contain my noble race. Yes, know that we are organisms on the march on the move, on the grow. Try to stop us, if you think you can.